The Diploma in Business Communication Skills course will enhance your professional writing techniques and improve your interpersonal and presentation skills. Good communication is absolutely essential for a business to function effectively, and for good relationships both with colleague and with clients and customers outside a business. The course highlights the principles of written communication. You will learn to write more successfully and develop the ability express your thoughts more clearly and in an efficient manner. You will learn about writing styles, how to plan for business writing, and which writing style is most appropriate for different situations. The course covers key communication skills needed for successful team meetings. You will learn about purpose statements and agendas for the meeting. The course also details communication skills needed to manage a meeting once it is in progress. You will learn how to transition from one topic to the next, how to help team members contribute and how to bring the meeting to a successful conclusion. 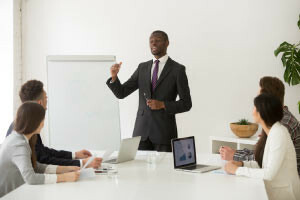 The course explains how to plan and develop effective presentations. You will learn how engage with your audience effectively. You will also learn how to be more confident when speaking in public. You will also be introduced to the concept of cross-cultural communication and its importance in the modern globalized workplace. Strategies for identifying both similar and divergent cultural characteristics across different cultures are discussed, along with why they play an important role in effective cross-cultural communication. This Diploma course will be of interest to all business professionals who want to improve their communication skills, and to any learner entering the world of business.